What is your favorite footwear to wear in your everyday life? Personally, I do love sneakers. There is known a wide range of sophisticated sneakers with a certain design to choose from. In today’s article, we are going to see slip-on sneakers that will make you look cool and ladylike. These designs are wearable to both formal and casual occasions, thanks to their simple appearance. Keep on reading to find out awesome ways of wearing this marvelous shoewear design. This is not a typical version of sneakers, as they come in a sleeker design. You better go for a casual yet ladylike look to wear them in your everyday life. Try on dark navy slip-on shoes styled with shortened white skinnies and hooded leopard/ navy coat. They do look somewhat minimalist, that’s why it is no hard of pulling off black and white color minimalist combo, by pairing black coat with white separates. Next was to make them look pretty cool is to achieve the model-off-duty look by wearing platform slip-on sneakers with a totally black outfit. Are you the one who wants to look laid back and stylish? If so, then go for a simple oversized white shirt-dress and complete it with dark blue slip-on sneakers. How about sporting matching prints? You gonna see gingham print dress styled with matching print slip-on footwear. In love with basics? If so, then you might like to try on simple separates, like cherry red slip-ons styled with knee-ripped jeans and a basic white T-shirt. The footwear provides that special pop of color to your favorite basics. 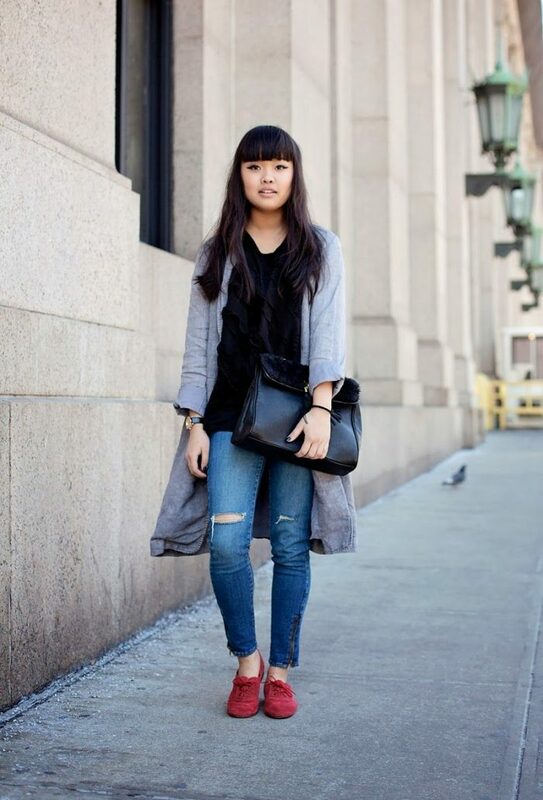 You can go for an edgy look by wearing an oversized jacket styled with ripped jeans and cool platform slip-on sneakers. If you want to create a statement, but you still don’t want to wear bright colors, then the best way is to try on animal print slip-on sneakers and pair them with awesome black leather pants, sheer white top and wool camel jacket. By the way slip-ons are ideal for comfortable office work. All you need is to dress up in usual office attire and pair it down with cool sneakers. All in all, this gorgeous footwear is perfect for harmonizing any style of attire. A simple combo for a Summer weekend. We see a biker inspired denim jacket worn over white tee teamed with a black mini skirt and black slip-on sneakers. Check my post about denim jackets for women, you will see plenty of cool and simple ways how to wear this outerwear nowadays. We see a lovely black-white gingham print dress styled with gingham print slip-on sneakers. Be sure to check my article on summer must-have dresses every woman should try. You are about to see lots of inspiring designs to wear from day to night. Do You have any thoughts about Best Slip On Sneakers For Women? Here are Fashion Tips pictures and trendy women’s outfits which are in style in 2019: Footwear Trends For Women, How To Wear Slip Ons, Kicks, Must Have Fashion Trends For Women, Slip On Sneakers, Slip Ons, Street Style Women's Fashion And Inspiration, Women's Sneakers And Running Shoes and tips on how to wear them on the streets.